Spicy with southern character! Paleo dinner recipes to make the mouth water. This delicious low carb salad recipe packs all the flavors of your favorite southern-spiced chicken dish. 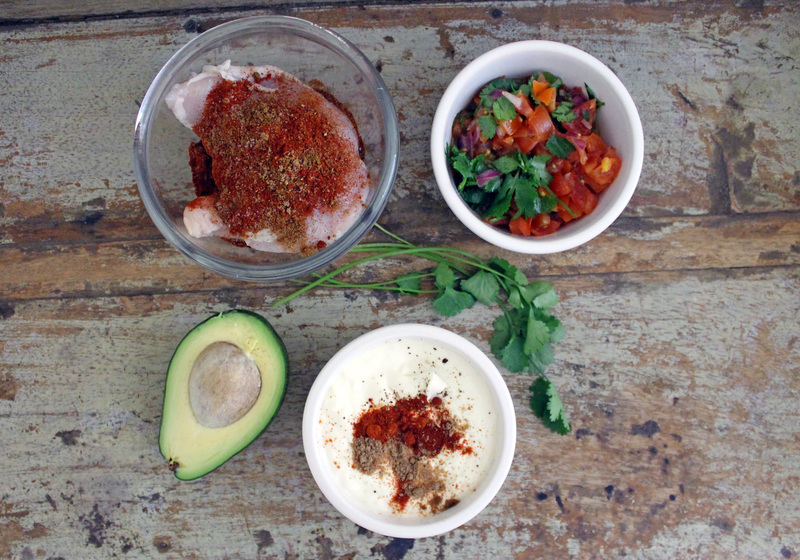 The heat from the chicken is perfectly complemented by a cooling, yet lightly spiced mayonnaise, a refreshing salsa and a simple yet flavorful salad. The ideal Paleo lunch or dinner, this is incredibly quick and easy to pull together. The use of coconut oil and olive oil to cook the chicken ensures there is enough fat to prevent the seasoning from sticking to the pan. This also creates a spice infused oil in the pan, which you can spoon over the chicken throughout the cooking process. Better still, pour the remaining cooking juices over the chicken once served. This salad is easily adaptable to suit dietary requirements. Not only is it naturally gluten free, but could be made dairy free by substituting the spicy mayo for a spiced coconut yogurt. To make the spicy chicken, combine the chili powder, cayenne pepper, ground coriander, ground cumin, pepper and salt in a large mixing bowl. Add the chicken breasts to the seasoning and use your hands to coat both sides of the chicken breasts in the spices. Add the olive oil and coconut oil to the frying pan over a low/medium heat. Once hot, add the chicken breasts and cook for 15-18 minutes, turning halfway through. Ensure the chicken is piping hot and cooked through thoroughly. While the chicken cooks you can make the tomato relish and spicy mayo. To make the mayo, simply combine the ingredients in a mixing bowl and stir to combine. Add more chili for extra spice. Refrigerate until ready to serve. To make the tomato relish, add the diced tomato, onion and fresh coriander to a bowl. Add the olive oil, apple cider vinegar, salt and pepper and combine ingredients. Reserve in the fridge until ready to serve. To make the salad simply arrange the lettuce on a large pate or sharing platter. To one side layer the sliced avocado, sweet peppers and fresh coriander. 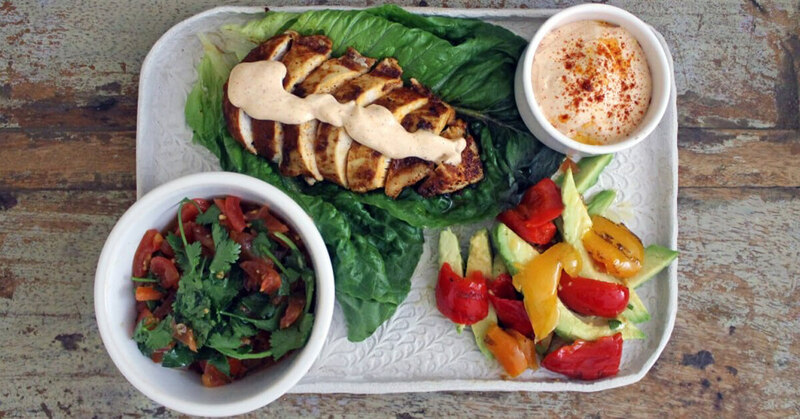 To serve, slice the spiced chicken and place on top of the salad leaves and dress with the spicy mayo. Complete with a bowl of tomato relish.